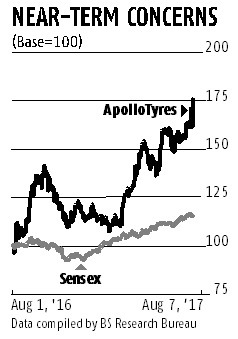 Even as the June quarter (Q1) numbers were poor, the Apollo Tyres stock clocked nine per cent gains in trade on Monday. Interestingly, even as there could be some more pain in the near term before prospects start looking better for the company, the Street is bullish on Apollo Tyres. Why? For one, there is expectation of good growth in demand in India, as well as likely gains from favourable policy initiatives. The management is positive about demand growth in India in the passenger vehicles segment and is hopeful of a revival in commercial vehicle (CV) demand. The initial trigger is the festive season, while improvement in the capex cycle and macroeconomic environment is expected to improve CV demand. The immediate trigger, however, is the 7-12 per cent anti-dumping duty on Chinese truck and bus radial tyre (TBR) imports. TBR imports had spurted sevenfold over three years to 1.4 million units, cornering 23 per cent of the replacement market, compared to eight per cent in FY14. The Directorate General of Anti-Dumping and Allied Duties has recommended anti-dumping duty of $245-452 per tonne on Chinese TBR tyres. It will be implemented after the finance ministry’s nod. In a recent note, analysts at ICICI Securities said the move will minimise the threat of market share loss to cheaper Chinese radial tyres. This duty would correspond to 10-15 per cent increase in landed prices for Chinese TBR tyres. 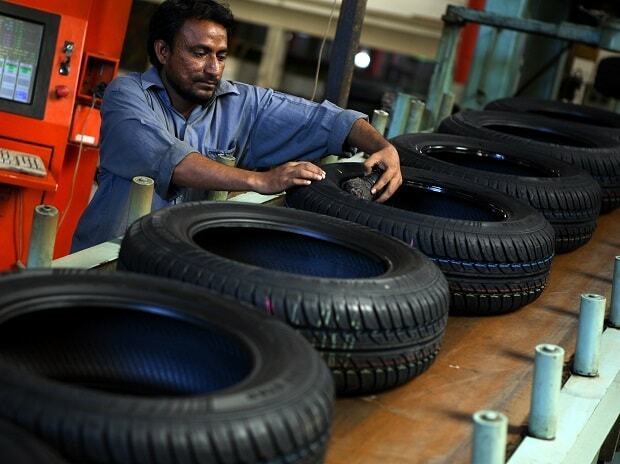 “Coupled with increased transaction cost due to stricter tax compliance post-GST (28 per cent applicable rate on top of 10 per cent Customs duty), the anti-dumping duty could largely eliminate the price differential between India-made and Chinese TBR tyres,” they said. Nishit Jalan and Hitesh Goel of Kotak Institutional Equities believe Apollo would be the biggest beneficiary of lower Chinese imports due to higher exposure to truck and bus segment, with the medium and heavy commercial vehicle (M&HCV) segment accounting for 60 per cent of the company’s standalone revenues in FY17. They expect the company to gain 400 basis points (to 30 per cent from the current 26 per cent) market share in domestic truck and bus radial segment over FY17-20. The timing of the news could not have come at a better time for Apollo Tyres, which doubled TBR capacity at its Chennai plant to 12,000 units a day recently. The news flow, however, has not been all positive. Q1 numbers and management commentary, especially on European operations, could mean short-term worries for the stock. The Q1 performance was below expectations across all parameters. Revenues at Rs 3,282 crore were down about one per cent over the year-ago quarter, against expectations of about Rs 3,500 crore. This was due to transition from BS-III to BS-IV emission norms, dealer inventory destocking ahead of rollout of the goods and services tax (GST), as well as rupee appreciation. India accounts for about 70 per cent of overall revenues and three-quarters of domestic revenues come from the replacement market. Destocking was, thus, disruptive to the company’s volumes, which were down four per cent year-on-year (y-o-y). Operating performance on a weak top line was further impacted by rising raw material costs and an adverse product mix. The GST-related disruption meant the share of the more profitable replacement segment fell sharply. With raw material costs surging 30 per cent over the year-ago quarter, operating profit was down 49 per cent y-o-y to Rs 273 crore. Margins slid to half the year-ago number at 8.3 per cent. Analysts had pegged the number closer to 12 per cent. Ashwin Patil of LKP Securities said there would be pressure on margins over the next couple of quarters with a recovery only towards the end of FY18. While commodity costs could be range-bound or decline, any gains especially on the European front will be offset by the start-up costs at the company’s Hungarian plant. Analysts believe once production ramps up, there could be some improvement in margins. The European operations account for 28 per cent of revenues and 15 per cent of profits at the operating level. The stock, meanwhile, scaled to its all-time high of Rs 288.30 on Monday before closing at Rs 286. Although most analysts polled by Bloomberg have a “buy” rating on the stock, their average target price is around Rs 275. Given the recent gains, long-term investors may consider it on corrections.